Do These Battle-Scarred Remains Belong to Alexander the Great’s Father? A new study suggests that Royal Tomb I—and not the more famous Royal Tomb II—is the final resting place of King Philip II, the powerful father of Alexander the Great, a claim backed by some very compelling evidence. Above: Lateral view of the left leg in flexion showing the knee injury. By performing scans and radiography on skeletal remains found in Royal Tomb I—one of three Tombs located on the Great Tumulus hill in the northern Greek town of Vergina, Macedonia—a team of archaeologists led by Antonis Bartsiokas say they’ve found the bones of King Philip II, his wife Cleopatra, and his infant son. Their study now appears at Proceedings of the National Academy of Sciences. A crucial piece of evidence is a battle wound found on the suspected remains of Philip II—an injury that matches well with history. During a 4th century B.C.E. fight over war spoils, the king was impaled by a lance, leaving him lame. Three years later, during his mid-40s, he was assassinated. Soon after, his wife and son were also murdered. 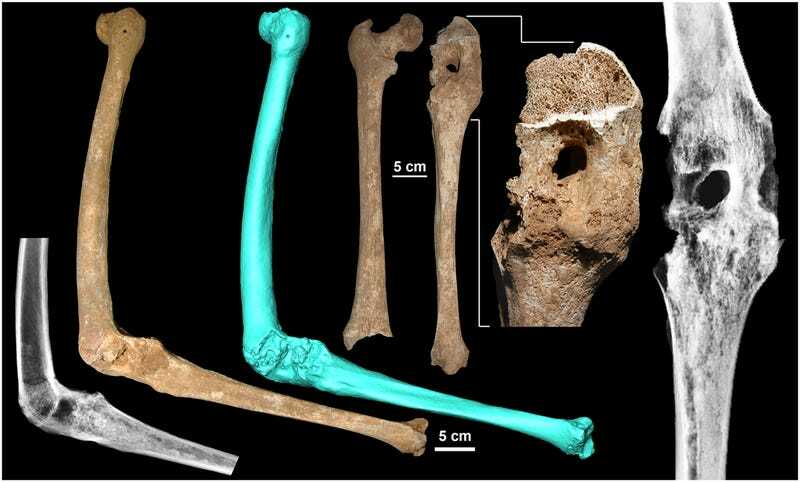 Analysis of the remains uncovered in Tomb I reveal an individual around the age of 45 with a hole near the knee, indicating inflammation and bone fusion (ankylosis). What’s more, the tomb contains an 18-year-old female and a newborn infant. “Thus, a nearly 40-year-old mystery concerning the Royal Tombs of Vergina has finally been solved that puzzled historians, archaeologists, and physical anthropologists,” conclude the authors in the study. The mystery refers to the discovery of two male skeletons in Tombs II and I back in 1977 and 1978 respectively. Read the entire study at PNAS: “The lameness of King Philip II and Royal Tomb I at Vergina, Macedonia”.